LaTeX is a featured book on Wikibooks because it contains substantial content, it is well-formatted, and the Wikibooks community has decided to feature it on the main page or in other places. Please continue to improve it and thanks for the great work so far! You can edit its advertisement template. This book is also available as a print version and as a PDF version. 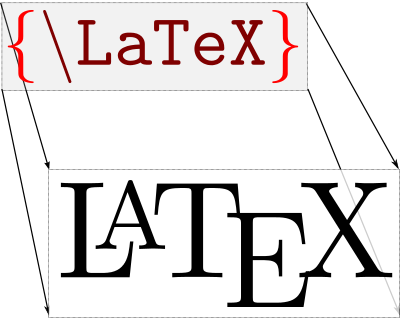 This is a guide to the LaTeX typesetting system. It is intended as a useful resource for everybody, from new users who wish to learn, to old hands who need a quick reference. TeX is a typesetting computer program created by Donald Knuth, originally for his magnum opus, The Art of Computer Programming. It takes a "plain" text file and converts it into a high-quality document for printing or on-screen viewing. LaTeX is a macro system built on top of TeX that aims to simplify its use and automate many common formatting tasks. It is the de-facto standard for academic journals and books, and provides some of the best typography free software has to offer. If you have questions related to LaTeX, ask at the Q&A. This page was last edited on 21 March 2019, at 10:43.